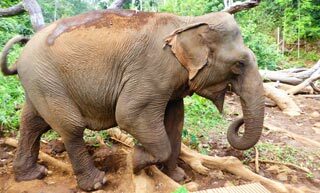 Sen Monorom’s big draw is to visit one of the eco-tourism elephant projects, along with trekking in the area to see the forest and to visit ethnic minority villages. Unfortunately, the rainforests and wildlife are at risk from poaching, logging and land being taken for rubber plantations. We covered two key projects that are working to protect the area in the highlights. Hopefully, an increase in tourism in the area will help protect it. Sen Monorom town is quite a small place, and while the people are friendly, there isn't a great deal for the tourist, except to see non-touristy rural small town life. 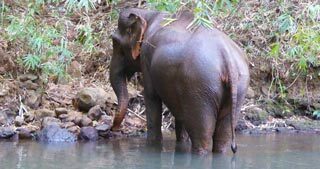 The length of your stay will likely dictated by the time you spend at one of the elephant projects.The length of your stay will likely dictated by the time you spend at one of the elephant projects. 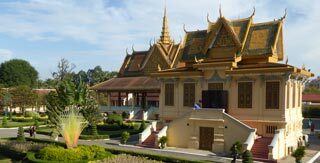 Sen Monorom is the provincial capital of Mondulkiri province, Cambodia's largest and yet most sparsely populated province. It has an interesting landscape of baron red-dusty patches, mixed in with lush green rainforests and waterfalls. 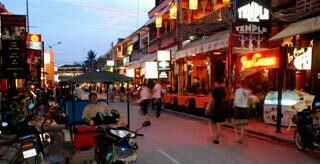 Its high altitude relative to the rest of Cambodia means it has a refreshingly cooler climate; you even need a jacket on an evening! 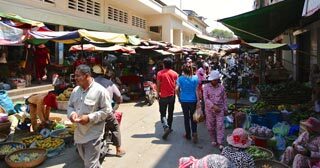 The population in the province is mainly ethnic groups (non-Khmer), with the Bunong by far the largest group. The Mondulkiri province used to be difficult to get to, but now a good road connects Sen Monorom to Phnom Penh, and a new road connects directly to Banlung.